One of the UK's fastest growing tech clusters with a raft of business support programmes on offer, should you start up in the Northern Ireland capital? Why start a business in Belfast? The largest city in Northern Ireland, Belfast’s position within the enterprise space is rising. An earlier survey by Tech Nation revealed that Belfast is one of the UK’s fastest growing clusters for technology, thanks to the burgeoning number of digital companies that have launched in the city over the past few years and the city continues to thrive. 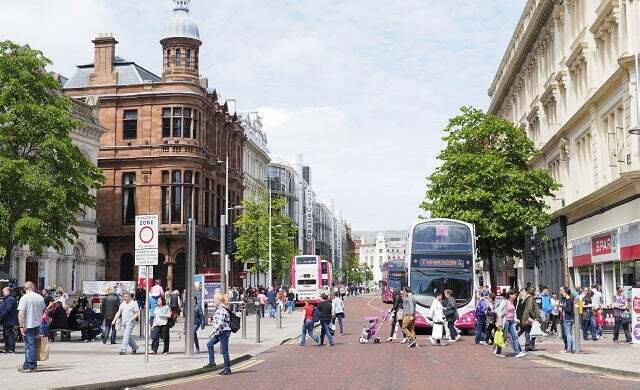 Transport links will soon improve with the introduction of a £90m Belfast Rapid Transit system – set to launch in September 2017 – and Belfast Council has continued to promote the city as one of Europe’s most “digitally connected” areas. Belfast already has good links for entrepreneurs on the move with Belfast City Airport and Belfast International Airport both under 15 miles of the city centre, and central motorway connections with the M1, M2, M3 and M5. The city is also home to the Port of Belfast, Ireland’s largest port for importing and exporting goods, which is a bonus for businesses looking to trade overseas. Office premises in the capital are readily available. Weavers Court Business Park is one of the largest office locations while you can also access serviced offices from Belfast’s CityEast centre and Albertbridge Road. The city also has a raft co-working spaces and hot desk sites such as The Foundry, Blick Studios, and Regus spaces like the Arnott House site which opened in November 2016. Flexible office space is likely to be the best option for start-up entrepreneurs as rents for premium office space in the city centre are escalating; a BBC report found that office rents are rising while Invest Northern Ireland (NI) has previously said there is a shortage of grade A office space in the city. Belfast has a great deal of graduate talent to offer prospective companies – according to Invest NI over 4,000 Belfast students graduate with business-related degrees and qualifications each year; a statistic which correlates to the city’s two universities Queen’s University Belfast and the University of Ulster. A Russell Group university, Queen’s is one of the UK’s top 20 research-intensive universities and attracts students from across the country which is a bonus for start-ups looking to take on graduates and qualified labour. On the whole, qualifications in Belfast are high; 32.5% of the city’s population are of working age with NVQ Level 4 qualifications and above. Despite its skilled workforce, salary levels are below average which could prove appealing for new business starting out in the area that don’t have the budget to pay for large salaries. For businesses just starting out in Belfast, support to create a business plan is offered from Invest NI in the form of an advisor. More information on how to start a business in Belfast can be found on NIBusinessInfo.co.uk, which provides information on how to start up in the city, as well as how to find out about networks and supply chains. Alternatively, Enterprise Northern Ireland provides training, business loans and premises across Northern Ireland. Belfast has two main accelerators; the first being Start Planet NI. Alongside equity investment of £15,000, potentially rising to £40,000, members of the three month programme also receive office space, guidance from entrepreneurs and mentors and there is the prospect of follow-on funding from Invest NI. Last year, the accelerator led a call for new members on Startups’ and will be pushing applications for its new cohort shortly. The second accelerator is Entrepreneurial Spark (ES) Belfast which, like many of the other ES hubs on the list, works in conjunction with NatWest to provide mentoring, investment and business support. Access to commercial space and lettings for start-ups and growing businesses is available from Belfast’s Northern Ireland (NI) Science Park, a 10 minute drive from the city centre. The park offers work spaces of all sizes, runs conferences and events for entrepreneurs, and actively encourages networking between its tenants. Start-ups that are not yet in commercial development can access finance from the Invest Growth Proof of Concept Fund, backed by Invest NI, which is a pre-commercial grant-award fund which offers funding to help individuals and micro-enterprises understand the commercial potential of a concept. Invest NI has a wealth of other funds available related to job creation, research and development, and innovation. Businesses new to research and development can also access grants of up to £50,000 from Invest NI to investigate a business idea, plan a prototype, and handle intellectual property costs. Seed stage and early-stage funding for tech businesses is available via techstart NI; a suite of advice, equity and grant funding for aspiring tech entrepreneurs. Operating across three arms; techstart can provide seed investments of up to £60,000 for product validation, up to £150,000 for market validation, and additional funds to support growth. In terms of grant funding, the initiative has grants of up to £10,000 for tech businesses looking to “accelerate concept development” as well as separate grants of up to £40,000 for tech start-ups looking to fund further customer development and product refinement. Angel investment can be accessed via HALO; the main business angel network for Northern Ireland part-funded by Invest NI and IntertradeIreland. Based at NI Science Park, HALO matches up companies with growth potential with high-net-worth angels, and is open to all Northern Ireland companies except for those in property or retail. Since 2009 the network has helped to facilitate over £7m from angels into Northern Ireland businesses. As to be expected for a capital city, house prices in Belfast are higher than much of Northern Ireland as a whole with average house prices for September 2016 at £149,252, according to the Northern Ireland Residential Property Price Index. This figure is markedly cheaper than other major UK cities, and the fifth most affordable place out of all 25 cities in our index. Belfast is big on entertainment, arts and culture – home to the Queen’s Film Theatre, the Grand Opera House, Naughton Gallery, and venues like the Waterfront Hall and Odyssey Arena. Cathedral Quarter and Queen’s Quarter are the places to head for good eateries while the city centre boasts a good mix of bars including Citigolf; a mix of golf, gaming, drinks, and karaoke, Bertz Jazz Bar; live jazz seven nights a week, and converted church bar The Empire. A first-hand account from an early-stage start-up on what it’s like to start a business in Belfast and what the city has to offer new entrepreneurs. You can also gauge insider opinion on what more Belfast needs to do to accommodate start-ups.